Go to original pattern for design DROPS 202-4. Crocheted jumper with puff stitches in DROPS Sky. 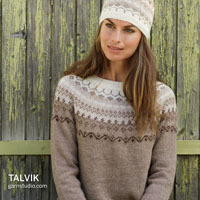 The piece is worked top down with lace pattern, long split and ¾-length sleeves. Sizes S - XXXL. Work as follows in the same chain stitch (it is important to work in the stitch, not around the stitch): * make 1 yarn over, insert hook through chain stitch, make 1 yarn over and pull through the chain stitch, pull both yarn overs long (to avoid the puff stitches becoming too small and tight it’s important to pull the stitches as far as possible, ie approximately 2 cm) *, work from *-* a total of 5 times, make 1 yarn over and pull through all loops on hook. Due to the elasticity of the yarn, take all measurements when holding the garment up so that it is not too long when worn. 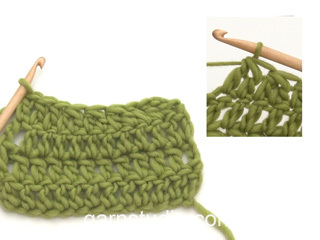 Decrease 1 stitch on the inside of the 2 outermost stitches in each side. Decrease 1 stitch by skipping 1 stitch. It is difficult to say where the decreases will occur in the pattern, but try to adjust so that they are worked on a row of treble crochets/chain stitches (not puff stitches). Front and back pieces are worked back and forth in sections, top down as follows: First work right shoulder front with increases for neck, then left shoulder front with increases for neck, before the 2 sections are joined and you work back and forth over all stitches to finished length. The back piece is worked in the same way. The sleeves are worked back and forth, top down. The garment is sewn together before working the neck. Work 28-36-36-44-44-52 chain stitches with hook size 4.5 mm and Sky. The first row is worked as follows from the right side: Work 1 treble crochet in the 4th chain stitch from the hook, * skip 1 chain stitch, work 1 treble crochet in each of the next 3 chain stitches *, work from *-* to end of row = 20-26-26-32-32-38 treble crochets on row. REMEMBER THE CROCHET TENSION! The next row is worked as follows from the wrong side: Work A.1C (= 6 treble crochets), A.1B over the next 12-18-18-24-24-30 stitches (= 2-3-3-4-4-5 repeats of 6 treble crochets) and finish with A.1A (= 2 treble crochets). Continue this pattern back and forth until A.1 has been completed, i.e. 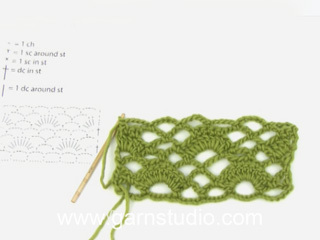 the last row has been worked from the wrong side and there are 22-28-28-34-34-40 treble crochets on the row. Cut the strand, lay the piece to one side and work left shoulder front as described below. Work 28-36-36-44-44-52 chain stitches with hook size 4.5 mm. The first row is worked as follows from the right side: Work 1 treble crochet in the 4th chain stitch from the hook, * skip 1 chain stitch, work 1 treble crochet in each of the next 3 chain stitches *, work from *-* to end of row = 20-26-26-32-32-38 treble crochets on row. The next row is worked as follows from the wrong side: Work A.1E (= 7 treble crochets), A.1B over the next 6-12-12-18-18-24 stitches (=1-2-2-3-3-4repeats of 6 treble crochets) and finish with A.1D (= 7 treble crochets). Continue this pattern back and forth until A.1 has been completed, i.e. the last row has been worked from the wrong side and there are 22-28-28-34-34-40 treble crochets on the row. Do not cut the strand, but work 31-25-31-25-31-31 slightly loose chain stitches for the neck at the end of the last row from the wrong side and fasten the chain-stitch row with 1 slip stitch in the outermost stitch towards the neck on the right shoulder front (from the wrong side). Cut the strand. Now work the sections together for the front piece as described below. The right and left shoulder fronts are now fastened to each other and you have worked chain stitches for the neck mid front (= 75-81-87-93-99-111 stitches). Start from the right side on the right shoulder front and work as follows: Work A.2A (= 2 stitches), A.2B over the next 66-72-78-84-90-102 stitches (= 11-12-13-14-15-17 repeats of 6 stitches, i.e. you work over the shoulder stitches and continue over the chain stitches in neck and each chain stitch counts as 1 treble crochet and then over the stitches on the left shoulder front until there are 7 stitches left on the row) and finish with A.2C (= 7 stitches) = 75-81-87-93-99-111 stitches on row. Continue the pattern back and forth like this. When A.2 has been worked 1 time in height, repeat A.X to finished length. 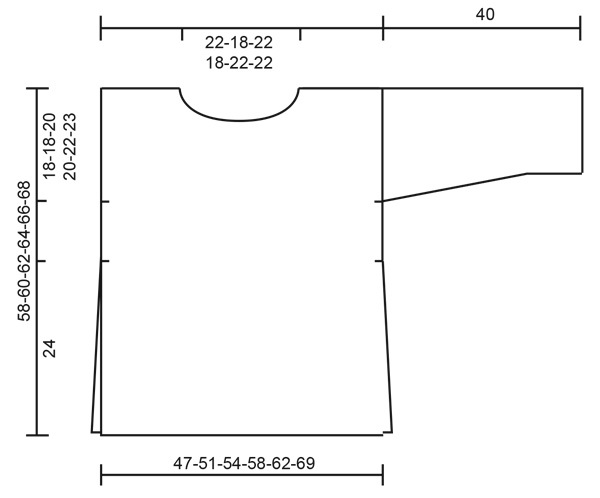 AT THE SAME TIME when the piece measures 18-18-20-20-22-23 cm from the cast-on edge – read MEASURING TIP, insert 1 marker in each side to mark the armholes. Continue working until the piece measures 57-59-61-63-65-67 cm. 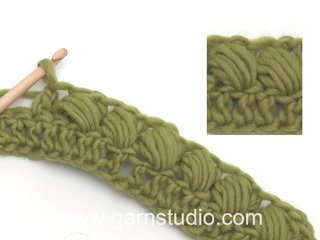 Finish the front piece with 1 row of treble crochets – choose a row from one of the diagrams which fits with where you are in the repeat, so that there are 75-81-87-93-99-111 treble crochets on the row. Cut and fasten the strand. The front piece measures approx. 58-60-62-64-66-68 cm from the shoulder down. Work 28-36-36-44-44-52 chain stitches with hook size 4.5 mm. The first row is worked as follows from the right side: Work 1 treble crochet in the 4th chain stitch from the hook, * skip 1 chain stitch, work 1 treble crochet in each of the next 3 chain stitches *, work from *-* to end of row = 20-26-26-32-32-38 treble crochets on row. Cut the strand, lay the piece to one side and work left shoulder back as described below. Work 28-36-36-44-44-52 chain stitches with hook size 4.5 mm. The first row is worked as follows from the right side: Work 1 treble crochet in the 4th chain stitch from the hook, * skip 1 chain stitch, work 1 treble crochet in each of the next 3 chain stitches *, work from *-* to end of row = 20-26-26-32-32-38 treble crochets on row. Then at the end of this row work 35-29-35-29-35-35 slightly loose chain stitches for the neck. Fasten the chain-stitch row with 1 slip stitch in the outermost stitch towards the neck on the right shoulder back (from the right side). Cut the strand. Now work the sections together to the back piece as described below. Right and left shoulder back are now fastened to each other and you have worked a row of chain stitches for the neck mid back (= 75-81-87-93-99-111 stitches). Start from the wrong side on the right shoulder back and work as follows: Work A.1E (= 7 treble crochets), A.1B over the next 66-72-78-84-90-102 stitches (= 11-12-13-14-15-17 repeats of 6 stitches, i.e. you work over the right shoulder stitches and continue over the chain stitches in neck and each chain stitch counts as 1 treble crochet and then over the stitches on the left shoulder back until there are 2 stitches left on the row) and finish with A.1A (= 2 treble crochets) = 75-81-87-93-99-111 stitches on row. Continue the pattern back and forth as follows. 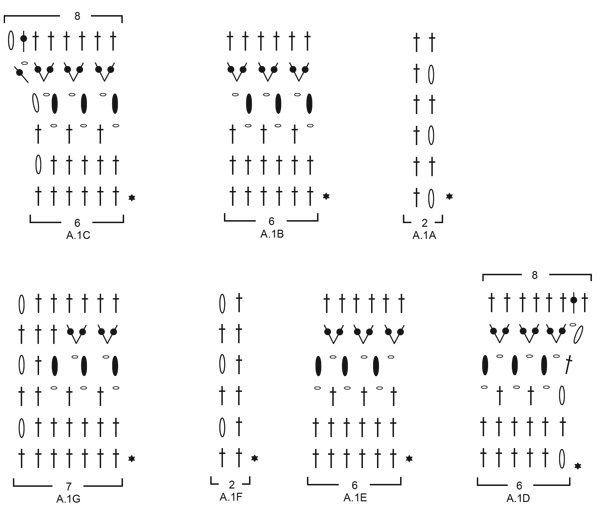 When A.1 has been completed work the next row as follows from the right side: Work A.2A (= 2 stitches), A.2B over the next 66-72-78-84-90-102 stitches (= 11-12-13-14-15-17 repeats of 6 stitches) and finish with A.2C (= 7 stitches). Continue this pattern. When A.2 has been worked 1 time in height, repeat A.X in the same way as on the front piece. AT THE SAME TIME when the piece measures 18-18-20-20-22-23 cm from the cast-on edge – remember MEASURING TIP, insert 1 marker in each side to mark the armholes. Continue working until the piece measures 57-59-61-63-65-67 cm and match it to the front piece. Finish with 1 row of treble crochets in the same way as on the front piece. Cut and fasten the strand. The back piece measures approx. 58-60-62-64-66-68 cm from the shoulder down. Work 77-77-85-85-93-101 chain stitches with hook size 4.5 mm. The first row is worked as follows from the right side: Work 1 treble crochet in the 4th chain stitch from the hook, 1 treble crochet in the next chain stitch, * skip 1 chain stitch, work, 1 treble crochet in each of the next 3 chain stitches * work from *-* to end of row = 57-57-63-63-69-75 treble crochets on the row. The next row is worked as follows from the wrong side: 4 chain stitches (equivalent to 1 treble crochet + 1 chain stitch), skip 2 treble crochets, * 2 treble crochets in gap before the next 3 treble crochets, 1 chain stitch * work from *-* until there are 3 treble crochets left on row, skip 2 treble crochets and finish with 1 treble crochet in the last treble crochet = 57-57-63-63-69-75 stitches on row. 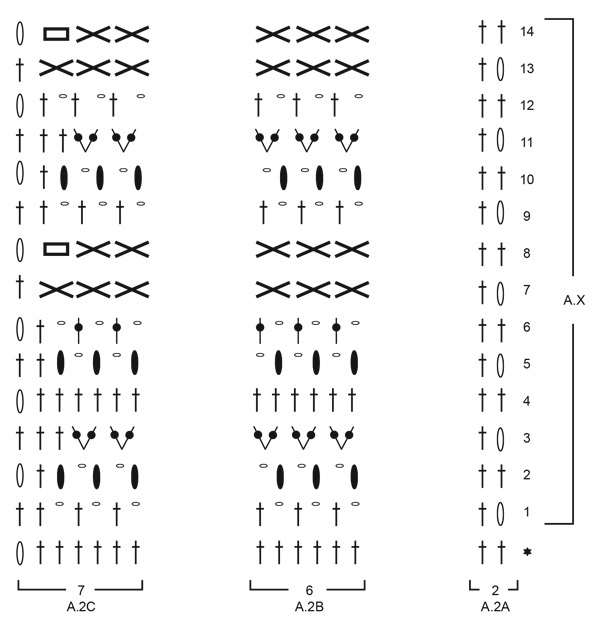 The next row is worked as follows from the right side: Work A.2A (= 2 treble crochets), A.2B over the next 48-48-54-54-60-66 stitches (= 8-8-9-9-10-11 repeats of 6 treble crochets) and finish with A.2C (= 7 stitches). Continue this pattern back and forth until A.X has been worked a total of 2 times in height (or to desired length). 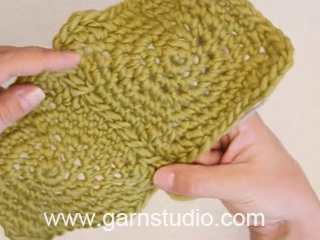 AT THE SAME TIME when the piece measures 3 cm from the cast-on edge in all sizes decrease 1 stitch in each side – read DECREASE TIP (= 2 stitches decreased). Decrease like this every 10-10-10-10-6-6 cm a total of 3-3-3-3-6-6 times in each side = 51-51-57-57-57-63 stitches on row. Cut and fasten the strand. The sleeve measures approx. 40 cm in all sizes. Work the other sleeve in the same way. Sew shoulder seams. Sew in sleeves between the markers on front and back pieces. Sew the sleeve and side seams in one go – start at bottom of sleeve and sew edge to edge in the outermost stitch, but stop the seam when there is 24 cm left on front and back pieces = split. ROUND 1: Work 1 double crochet in the first stitch, * 3 chain stitches 1 double crochet around next row/chain-space *, work from *-* to end of round and finish with 3 chain stitches and 1 slip stitch in first double crochet at beginning of round. ROUND 2: Work slip stitches to middle of first chain-space, work 3 chain stitches (equivalent to 1 double crochet + 2 chain stitches), * 1 double crochet around the next chain-space, 2 chain stitches *, work from *-* to end of round and finish with 1 slip stitch in first chain stitch at beginning of round. ROUND 3: Work slip stitches to middle of first chain-space, work 2 chain stitches (equivalent to 1 double crochet + 1 chain stitch), * 1 double crochet around next chain-space, 1 chain stitch *, work from *-* to end of round and finish with 1 slip stitch in first chain stitch at beginning of round. Cut and fasten strand. Last line of PUFF STITCH: a total of 5 times, make 1 yarn over and pull through all loops on hook. Pretty, floaty design, looks like a fun crochet.